Why you need to test the HDD speed? Hard drives are there to store your data and serve it to the system and applications whenever they store it. Hard disks differ in how reliable they are at storing information and how quickly they serve in on request. Measure data transfer speed with HD_Speed. 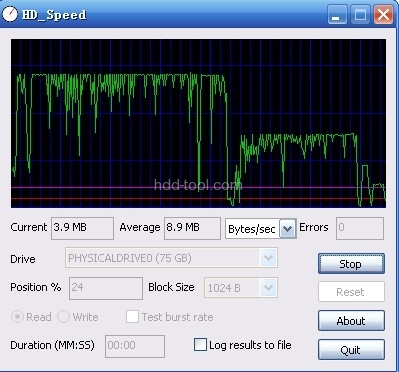 HD_Speed is a tiny utility that measures the speed of data transfer on your hard disks. The program works under Windows 2000/XP only, although it supports both FAT and NTFS volumes. The tool does not require installation and runs right out of the box: run it, select a logical or physical drive and hit the “Start” button, and the test will begin. The results of the test will show up in real time both on the diagram and in absolute values below it. Stop the test whenever you like it and proceed to the next drive.